Lifting Sets For Drilling Equipment to make augering and sampling easier. 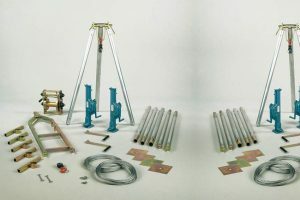 Our Lifting Sets are multi functional so ideal for deeper hand drillings, removing casing tubes, lowering/lifting equipment, installing wells and general hoisting activities. As a tool to help perform deeper hand drillings or for drilling with heavier drilling equipment. For removing casing tubes and lowering/lifting drilling equipment. For the installation of water wells and submersible pumps.